You might have noticed the whitewashed house in Spanish neocolonial style on Glenora Street. The house was built by W.E. Noffke, who grew up in our neighbourhood. Several years ago, when Patrick Plourde, the owner of 182 Glenora Street, was doing some work at my home, he mentioned the architect whose houses often feature red-tiled roofs. From then on, I noticed red tiled roofs everywhere. That’s because W.E. Noffke, who designed the house on Glenora for a relative, was one of Ottawa’s most prolific architects. His buildings include the Old Ottawa South Firehall on Sunnyside Avenue, the Champagne Bath on King Edward Street, the Medical Arts Building on Metcalfe Street, and numerous residential buildings, many of them in the Glebe. 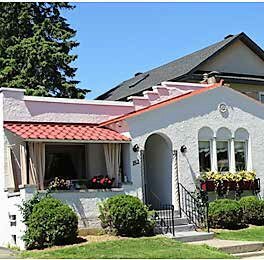 In an attempt to preserve Old Ottawa East’s rich cultural heritage, in 2017, a list of properties was compiled for the City of Ottawa’s Heritage Register, including the property on 182 Glenora Street. W.E. Noffke was born in Stolp, Germany on April 9th, 1877. His family left Germany in 1884 along with 84 other Germans, all of whom headed to Ottawa, where Noffke’s family settled on 25 Third Street (now Montcalm Street). Noffke attended the German school at St. Paul Lutheran Church on Wilbrod Street until the age of 14. At the recommendation of the Lutheran minister, he then joined the architect office of Adam Harvey. Noffke never received formal training in architecture, instead of learning his trade on the job and in night classes. In fact, during Noffke’s time, there existed no formal structured training program for architects anywhere in Canada. Those who couldn’t afford to study in the US or Europe had to take courses in art studies and applied art in addition to their apprenticeship, which is what Noffke did. In the 1901 census, (Rick Wallace: A history of Ottawa East: http://history.ottawaeast.ca) W. E. Noffkeis listed as an architect, living at his parents’ home on 25 Third Street, earning $468 per year. In 1904, at the age of 27, he married Ida Jordan who lived a block away on 28 Fourth Street, and they settled in Ottawa East. In Thomas W. Carkner’s book about Ottawa Germania Founding Families, Carkner reproduces the Ottawa newspaper coverage of the event. Eventually, W.E. Noffke built a house for his family on Wilbrod Street, across the street from the St. Paul Lutheran Church. Becoming more and more successful, the family then moved to 20 Clemow Avenue, a typical Noffke house which showcases decorative brick work adorning the doorways and window openings, stain glass windows, a dormer and, a typical Noffke feature, a billiards room in the basement.